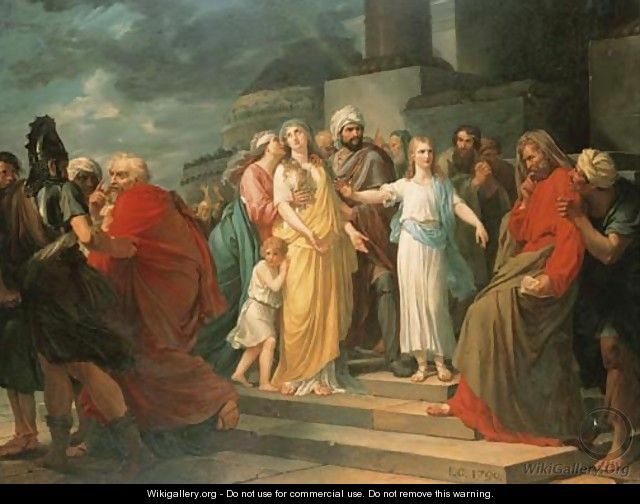 Dn 13:1-19, 15-17, 19-30, 33-62 Two wicked elders lusted for Susanna, hurried to her when she was alone bathing, and threatened to testify against her if she didn't lie with them. She shrieked, people rushed in and heard their accusation, believed them, condemned her to death, she cried to God, and God stirred Daniel: “Don't condemn her without examination or evidence. Return to court; they testified falsely.” All returned. “Separate the two.” He asks each what tree she was under, their answers differed, the assembly rose up against them, and put them to death, sparing Susanna's innocent blood. Ps 23:1-6 "Even though I walk in the dark valley I fear no evil; for you are at my side." The Lord is my shepherd; he gives me repose, guides me, gives me courage... Only goodness and kindness follow me, and I'll dwell with the Lord. Homily: Marriage is a symbol of a faithful relationship between God and his people; when a marriage is spoilt by adultery, it spoils the relationship with God. But the Pharisees cared nothing about the woman or adultery; they just wanted to trap Jesus. Jesus defended the woman against just condemnation, didn't humiliate her, and went beyond forgiveness; he shows mercy in saying to go in peace and not sin again. Our condemnation would be just, but with the same mercy he forgives and goes beyond, putting sin to the side. God's mercy is like the sun overpowering the stars: a light of tender love, forgiving and healing. [To sick and elderly:] Offer your suffering with Jesus on the Cross. [To ex-cons and addicts:] The Lord is in our frailty. Creighton: In the first reading, the truth of claims was investigated, guilt established, and punishment meted out; in the gospel; Jesus steers the elders away from judgment and doesn't himself condemn. “Who am I to judge” when I'm not God and don't know people's hearts? Just treat others with compassion, forgiveness, and mercy. DailyScripture.net: When accusations are brought against you, how do you respond and where do you turn? The word "write" in today's Gospel literally means "write down a record against someone" (as in Job 13:26). Was Jesus listing the accusers' sins? Moved to greater love Jesuit meditation on union with Jesus while journeying with Him to the cross: How have I judged and "stoned" others while being blinded to my own sin? What areas in my life weigh on me? What areas need forgiveness or healing? Where am I called to restore human dignity, as Christ did? "In the Hands of God" (Arrupe after stroke); "A Fire that Kindles Other Fires" (SJ GC 35, Decree 2) on discipleship, announcing the gospel to the poor, faith and justice, human needs, and Jesus' healing ministry. Sunday's family Mass with parish elementary school choir. (I wish there had been room for them in front, vs. choir loft. Highlights: What wondrous love is this (choral setting); and Where are the angels/ Schram (more from her) after Communion organ instrumental. I wish the logistics could have permitted an assembly-sung Communion song while the children were receiving. Song leading: 4 robed students led from around the podium mic when they weren't upstairs. Hats off to these girls for being in front at those times, but I (in front row) couldn't hear them (likely because they couldn't get closer to the mic). The chanted Mass parts worked well, though a few cues were missed. I wish one had sung the responsorial psalm so we could have sung (vs. reciting) the antiphon.